Our journey in Slovenia started with a good descent down from the Wurzenpass to Kransjska Gora, a popular ski resort but with only patches of snow left now. Higher up the mountains there was still plenty of snow however which meant that the famous Vrsic Pass with it’s 48 hairpins had closed again and we had to plan a different route south. Up until now our route had more or less followed the plan Jules had meticulously mapped out before we left the UK. Now we are in unknown territory but our digital mapping app OsmAnd still has a remarkable amount of information on cycling tracks so we managed to work our way to Lake Bled almost entirely off road, passing over the clearest blue streams and the greenest fields, dotted with small holdings. It looks like the farming techniques here haven’t changed for hundreds of years and it was refreshing to see small crop rotations and families out working in the fields together. Although, we saw some fairly precarious pruning techniques, often with the oldest-looking man up on the highest branch with a very rickety ladder for stability! What should have been an easy afternoon to Bled took a turn when Jules narrowly avoided a fall after his rear wheel locked up suddenly. Luckily it was just a broken mudguard and not a problem with the Rohloff hub but it did require the wheel to be taken off, and an hour on the side of the road that wasn’t budgeted for. 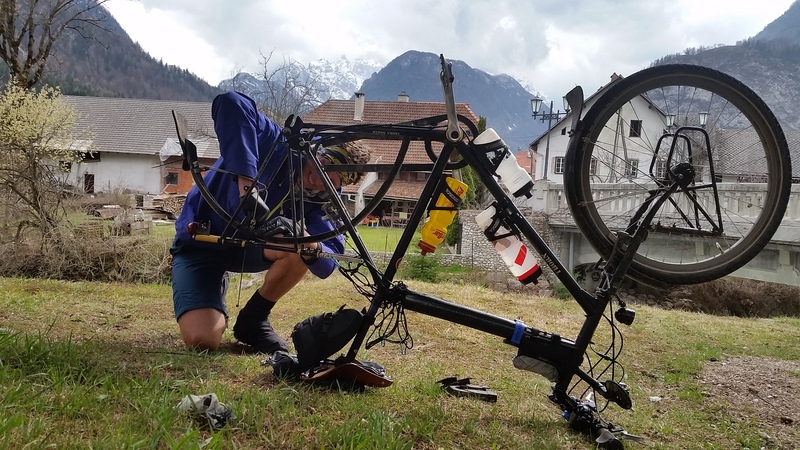 After 2000kms this was only our second mechanical break so not too bad (the first in Switzerland). From Bled we decided to go off the beaten track and follow some cycle paths south-east to Skofja Loka where we had a Warmshowers host. Beautiful quiet roads wound up and down (definitely nothing flat in Slovenia) to Kropa, an old iron mining town at the end of a valley. A good 400m climb through the forest to Jamnik there is a beautiful church at the ‘top’ of the hill, a good place for a break but definitely not the top as you drop down before heading up again to the summit. By chance we passed an pub/restaurant just past Drazgose on the way down the valley and what a find! We ate traditional Jota (saurkraut & pork stew) prebanc (Serbian bean cassoulet), a pizza and appple strudel. Jules still could have eaten more! The owner is super knowledgeable and also has a collection of WW1 artefacts. It turns out that the area is well known because they formed a strong resistance movement, beating the Germans at a time when they were thought to be unbeatable and giving momentum to the partisan movement. We have cycled past so many WW1 and WW2 monuments in Normandy, the Dolomites, Austria and here in Slovenia, in areas that are now so quiet and peaceful. With so much conflict happening in other parts of the world it does make you stop and appreciate the relative peace we have in Europe right now, long may it last. Our Warmshowers hosts in Skofja Loka were incredible, cooking locally foraged food (wild dandelion salad & wild garlic soup) and teaching Milly to make strudel the ‘no sugar’ way. They kindly let us stay an extra day due to awful rain, and also helped us plan our route south. First, through the stunning Krajinski Park in Rakov Skocjan where natural bridges have formed as the river has cut through the rock over thousands of years, disappearing underground six times from the source to the river mouth. Following the forest tracks we suddenly came out of the woods overlooking Cerknisko Jezero lake, either Slovenia’s biggest or smallest lake depending on the rainfall. It was in full flood and looked spectacular. The icing on the cake however came at the south side of the lake when we looked back to see Triglav (Slovenia’s highest mountain) and the Julian Alps glistening in the sunshine. It was a magical last day in Slovenia. We wished we could have spent more time there to explore. The landscapes are so clean, green and raw, actually a lot of it reminded us of New Zealand! We’ll have to revist - for Jules to climb the Vrsic Pass, and for Milly to see the bears (from a lodge not a tent)! Adijo Slovenia - we’ll be back!